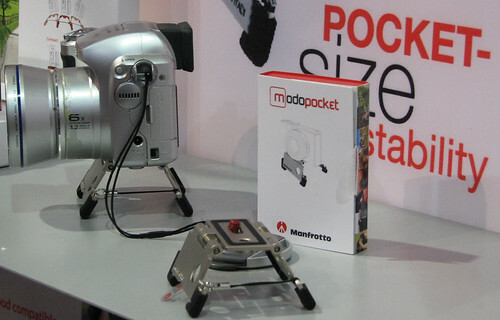 If you're not content with balancing your digital camera on a rock or wall when you want a specific perspective, the Modo Pocket may be an ideal solution for your photographic needs. Essentially a small metal kick-stand for your camera, the Modo Pocket attaches to the tripod mount on your camera and includes two movable legs that adjust so that you can get level shots why propping your camera on almost any surface. I'm more inclined to use some combination of my bottle cap tripod and a Gorillapod while out on a hike, but I can see where the Modo Pocket might be another convenient way to help get the perfect shot. At $29.95 this is the most affordable "tripod" ever released by Manfrotto / Bogen.